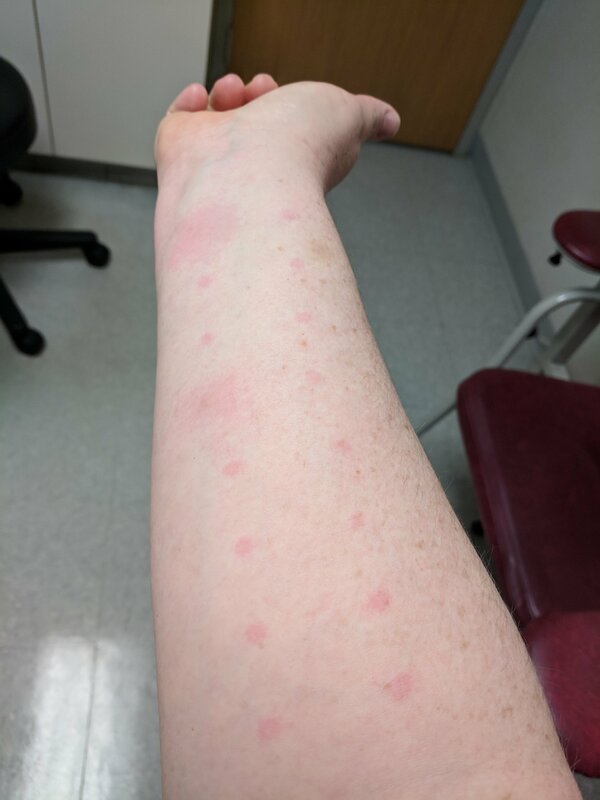 I had a nice visit with the allergist today. Bright and early. Well, not bright because thanks to day light savings time and winter, it’s damn dark these days! And rainy. Anyway, where was I? Right, at the allergist. Getting poked and prodded. Yesterday I went back to visit the ENT surgeon who did my throat surgery two years ago. He did the same yucky scope again and said that there is definitely blockage. Again! In fact, he showed me the hole at the top of my trachea and said it should actually be 3-4 times larger than it is! I said, “would that explain..” and he said, “Yes! The wheezing and the breathing and everything.” The real question though is “why?” Why does this keep happening? After further discussion, the going theory is acid reflux. I did a little research and it all does fit together. So the next step is to make a plan for reflux meds and schedule surgery — again. Soo… I decided I’m tired of coloring my hair and I’m going to let the grays grow out. I’m hoping I won’t look super old and awful when it’s all gray, but also I just don’t feel like paying the $$ and taking the time to keep coloring it. The roots always show before I get back to the salon, so I’m not really fooling anyone anyway. Alan is pretty excited about this. He said, “Finally we’ll be matchy matchy!” The kids thinks it’s cool, and Eve is hoping that when it’s all gray I’ll dye a streak bright purple. They are all kind to me. I got two good laughs this week from kids who are apparently starting to notice. 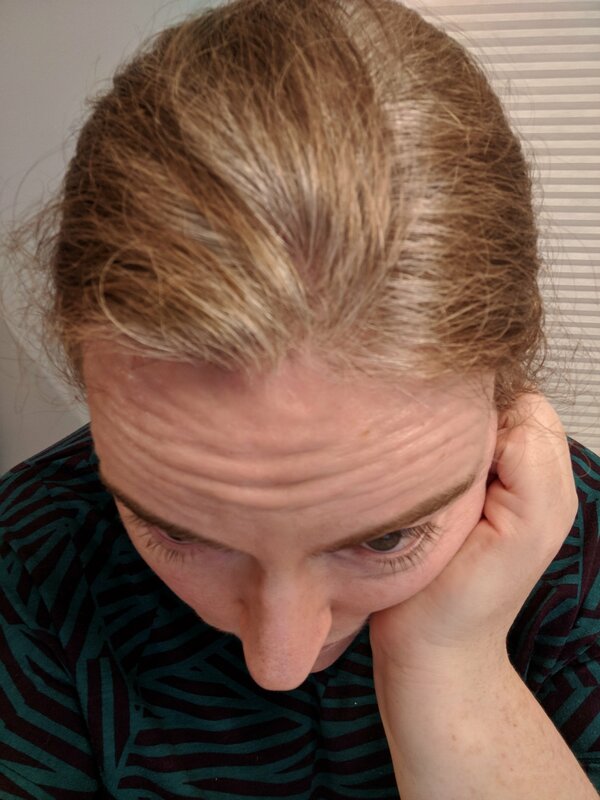 A fifth grader stopped mid-sentence and said, “You have some silver in your hair!” Then he quickly reassured me that it’s ok because it might just be the way the light is hitting my hair and it’s only on one side and besides his grandmother had gray hair and she died last summer when she was 100 years old. I barely got a word in before he was off again. Today Eve has a friend over and his little sister, who is in Pre-K, said “Oh Mrs. Johnson, you have gray hair!” I said yep! She said “oh” and turned to talk to her sister about something else. All of my blog post for the next year and a half are going to be about how exhausted we are around here. Eve was home sick today with an ear infection, I went to school sick (shh!) with a sore throat. I took us both to the urgent care center this afternoon to make sure it wasn’t strep. It’s not, so we will both be back at school tomorrow. Only 27 more days of school! The house plans are totally overwhelming. So many decisions to make and we can only hope that we’re making the right ones! I hope when it all comes together we aren’t like, “Ew, did we really chose that color?” (you can replace “color” with cabinets, counters, fixtures, lights, siding, roofing, trim, flooring, etc!) We have a buyer who made an offer that was way lower than we were expecting. Two realtor confirmed the price though, so we are going with that buyer. The buyer’s agent is also our seller’s agent (they worked for the buyer first), so I hope that isn’t detrimental in the long run. I hope taking the low offer, also the first offer, is better than waiting and listing the place and hoping for a better offer. I’ll never know, of course, cause you can’t know what’s down the path not taken, but I hope we’re making the right choices. Lex went to bed in tears tonight because he is exhausted from his musical rehearsals. The show opens on Thursday and runs through Saturday, so it will be all over soon. Just a few more late practices, then a few very late nights, then he can rest. He’s falling behind on homework and struggling to stay positive. He isn’t thrilled with the job he has on the stage crew (not much to do), but knows that if he sticks with it there will more interesting things to do next year. That’s hard to remember sometimes though. Eve also has a play coming up. She’s be performing on Northern Stage. So cool! (I’m probably repeating myself here but I’m too lazy to reread my previous posts, so sorry, not sorry.) She is struggling with girl friend issues and growing up and all the fun things that go along with that. We all just need a good, long nap! For days! I’m trying to get my financial aid sorted out before my two courses start next week. I also recently found out that my health insurance is so much better and so much more affordable than the miserable plan we have through Alan’s job, so we are in the process of switching that over. Like I said – exhausted! You can probably stop reading the blog now because I’ll probably just post this same nonsense over and over for the next 18 months. On the plus side, I got a new phone. I just went to find a cute kid picture (or even dog or cat picture!) to wrap up this post in style, but all the pictures on my phone are of snap circuits and school kids! Oy! Maybe another time. I need to put myself to bed now before I continue to eat everything I can get my hands on, despite my sore throat. Good night. Hey all, I think this blog is losing steam. That makes me sad, but also not surprised with the influx of social media and group chats; plus my kids are getting bigger and less interested in having their private lives on public record; and that whole working thing that takes up a lot of my time these days! I am gloriously home this week, relaxing on the couch and watching too much tv. They call it “resting,” not something I’m generally good at! :) Actually, this week we’re calling it “healing” and something that is very needed, mentally and physically! Third paragraph and third time sitting down to write this. Sigh. Things are going well. I’m healing. My throat is feeling less sore and I haven’t taken an pain reliever since 1pm this afternoon. :) On Tuesday the ENT surgeon did a “quick procedure” (only 74 minutes fully sedated!) to remove some scar tissue from my trachea in an attempt to open up that airway and help me breath a little easier. I’ve been dealing with this for awhile now and tried several different asthma meds first, with minimal success. Yesterday I made it out for a few errands and lunch with a friend. I was exhausted by the end and my throat was sore. Today felt like “back to real life” with karate and Lego League practice requiring me to be up and out the door early. Tomorrow is the Lego League competition and it will be a LONG, LOUD day! I’m going to bring extra pain reliever, just in case! Monday is a full day of school, and I’m already looking forward to Tuesday and Wednesday, my quieter days in the library! Ok, outta here for now! Lots to prep for tomorrow and we have to be out the door bright and early!